Until now, a system with triple-SLI pre-installed has been a dream - theoretically possible, but never actually seen in the wild. That is, until the arrival of Advance Tec's new machine, comprising no fewer than three beefy BFG 8800GTX graphics cards. Unsurprisingly for a rig containing three humungous graphics cards, it's neither small nor light, with all the components shoved into a Coolermaster Cosmos case like big rectangular sardines in a designer tin. The build quality of the whole thing is mightily impressive, and in little danger of overheating. 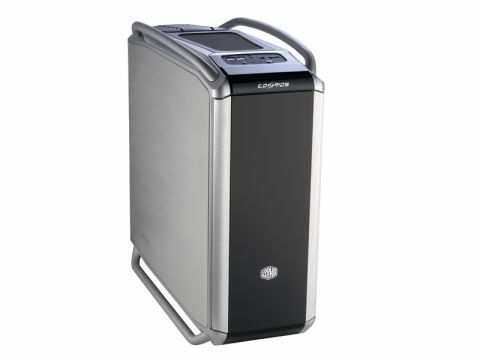 The case looks the part, and barely a whisper is heard thanks to the Coolermaster's neat acoustic design. Like any rational being, the first thing we did was to run Crysis at maximum resolution. It struggles at the highest texture rates, but performs very well with medium settings - and still looked so real we began booking tickets back from the South China Seas. World in Conflict also performs incredibly at high resolution and maximum detail, with the frame rate staying well into double figures. But the cynic amongst us (Alan) suggested that we find out just how much of a difference the triple-SLI setup really makes. So a test was devised. We benchmarked World in Conflict and Call of Juarez with three cards, made a note of the result, then tried two and finally one card. World in Conflict's average frames per second shows a drop of about a quarter each time a card is removed, and Call of Juarez shows a drop of a third on removing one card, then almost another half with a solo card. So not only is this machine incredibly well-built, it's also properly configured and optimised for triple SLI. The only sticking point is the price tag, which at £1,755 is fairly hefty - although it scores better on our benchmarks than other recent, more expensive machines, and the fact is that three top end cards don't come cheap, so keeping the machine under the two grand mark is an impressive achievement in itself. Don't forget, for your cash you're getting a factory overclocked, triple-SLI rig with none of the worries of setting one up. The ram isn't 4GB, and the processor isn't quad-core, but they competently back up the graphics cards and most importantly, the PC is more than up to the job. If you have the cash, it's a winner.